My first historical clothing was ancient Greek. This was because the majority of events I attended were in the summer in Florida where it was very hot and very humid so flowing light linen was surely the way to go, and was also the easiest of all things to sew! 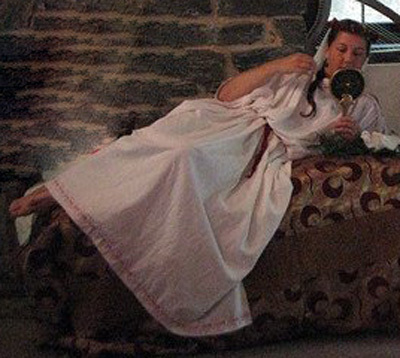 There are a few things to get to know about early Greek clothing, it is not difficult, should not be revealing, and is all about the drape and flow of the fabric. It is also outstandingly simple and can be composed of large rectangles of hemmed cloth when draped, pinned, and tied properly. 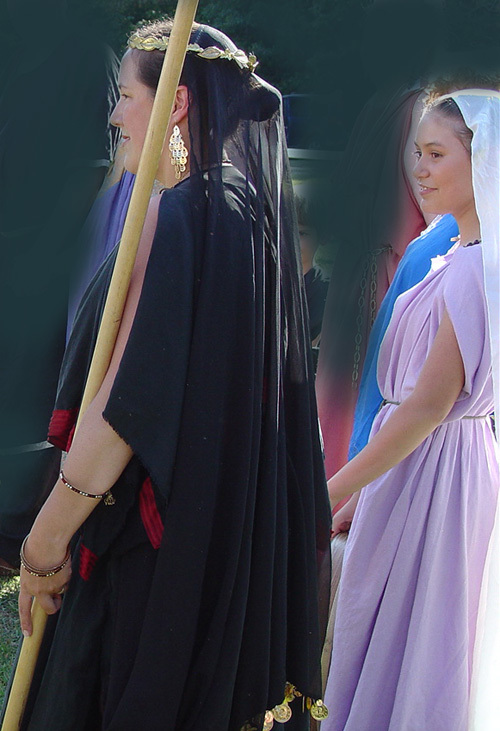 Even with years of wearing my first two peplos I do not have any pictures of them yet so for now I am just sharing these two most recent Greek outfits that are somewhat stylized because they were created for a play in the 16th century Italian style of reenacting Greek mythology. 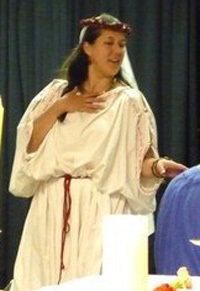 The white linen with red embroidery uses symbolism in the coloration and roses as a representation of Aphrodite in the Judgement of Paris and the black silk with gold represents the Queen Clytemnestra in her act of revenge in the second act of the play. A simpler and more accurate lavender chiton on my daughter was worn as she played one of the musicians.